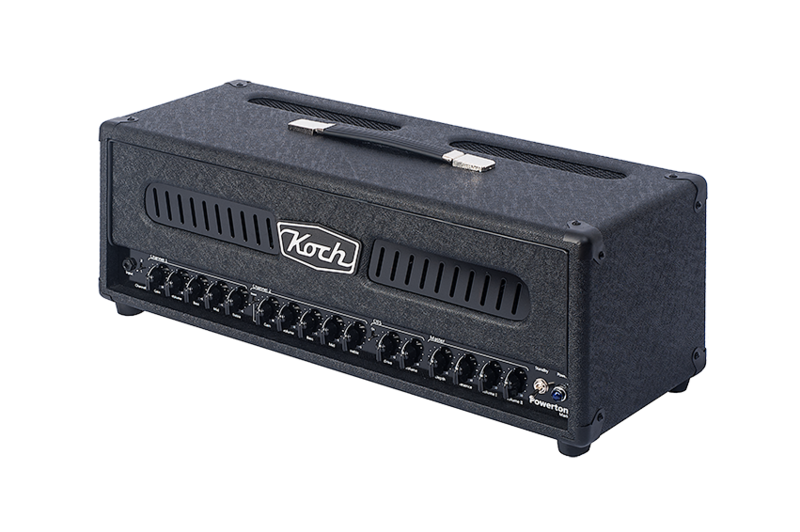 Koch Powertone III head overview. 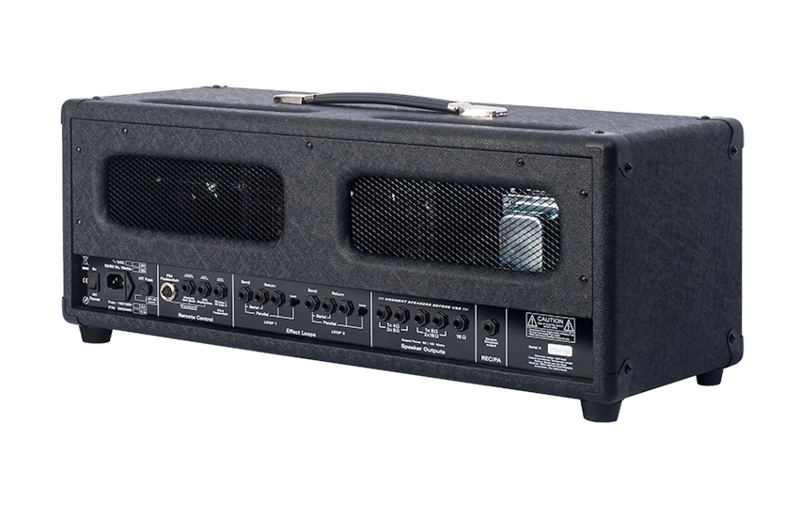 The Powertone III is the successor of our Powertone I and II amps. 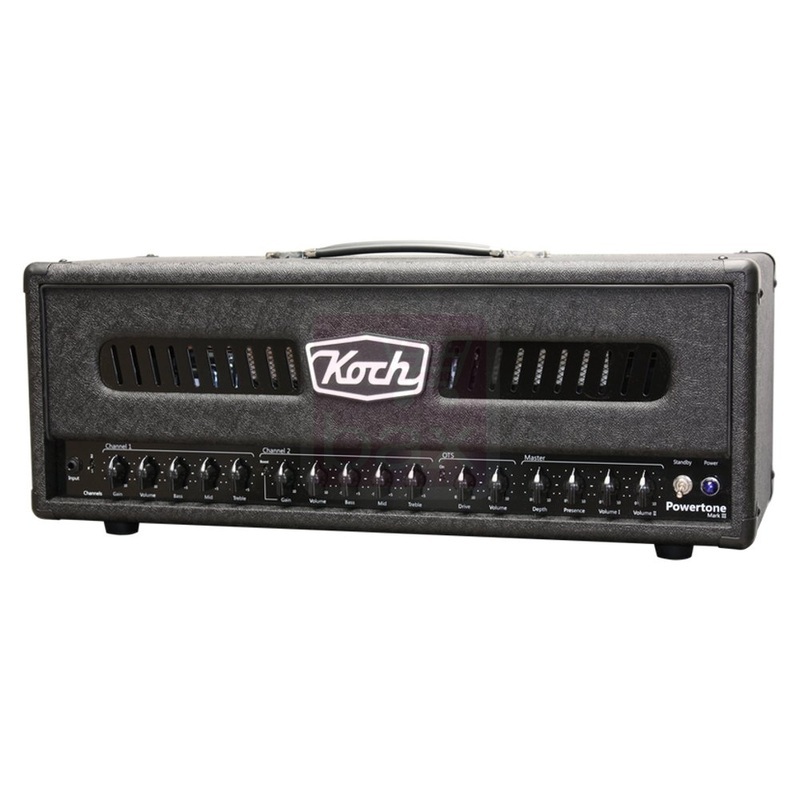 Our Powertone amplifiers have always been popular among heavy rock & metal guitar players from all over the world. While developing the Powertone III we wanted to preserve the best features of its predecessors, and improve on the original design. We added several new features, such as a Drive control on the Clean channel, an OTS © circuit, Depth and Presence controls, switchable dual Master volume controls, two serial or parallel FX loops which can be bypassed, and remote MIDI control of all switchable functions. The Powertone III is available in a 50 Watts or 100 Watts version. 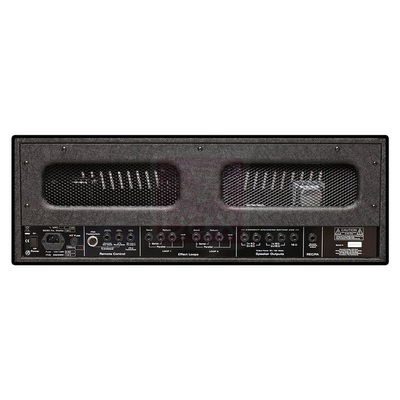 Depending on the output power, the power section features either two or four EL34 Power tubes. In order to accommodate a Koch speaker cabinet or any other extension cabinet, the back panel of the Powertone III features five speaker output jacks for connecting 4, 8, or 16 Ohm speaker cabinets. Channel 1 offers a wide variety of sounds from sparkling cleans with tons of headroom, all the way to moderately overdriven sounds. With the added Drive control, Channel-1 offers a greater variety of tones while preserving the wonderfully warm and crystal clear tone of the Powertone I and II. The ‘Distortion’ channel (Channel 2) has been re-voiced to a unique American-style character. 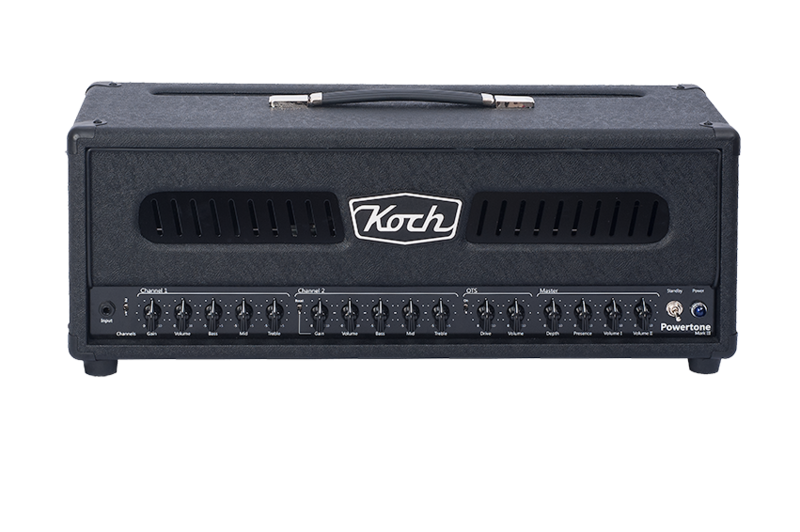 The high-gain and ultrahigh-gain tones will now give you a tighter, more complex and harmonically rich sound with lots of definition, depth and of course tons of power. Another new feature on the Powertone III is the OTS circuit. The OTS circuit is a little tube amp that can be overdriven to create real power amp distortion at any volume level. With the OTS Drive control you can add a great sounding tube saturation to both Channel 1 & 2, while the OTS Volume control allows you to boost (or cut) your volume. The OTS circuit should be considered as an on-board effect unit which you can turn-on or bypass with the footswitch. With these two channels and OTS circuit you can create any sound you have Always dreamed of. 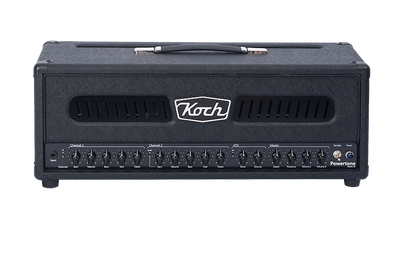 From pristine clean tones all the way to exciting high-gain tones with infinite sustain, the Powertone III will amaze you. 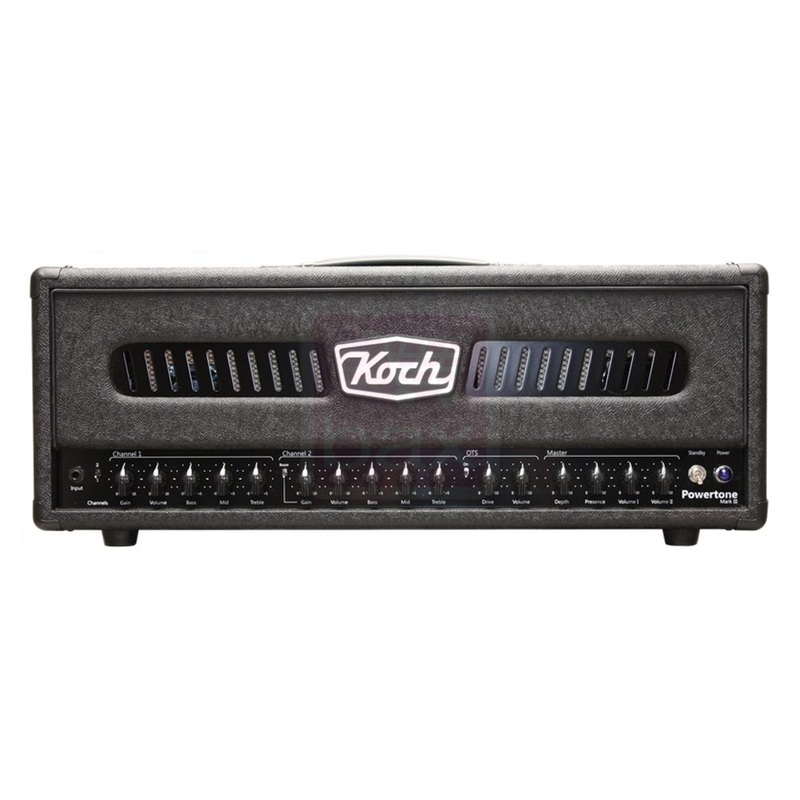 The Powertone-III also features two separate switchable Master Volumes. With the footswitch you can switch from Rhythm to Solo volume, giving you more power to make sure your solos will always be heard. In order to create a more authentic sparkle, and to allow the Presence control to operate on both the Clean and the Gain channels, we’ve relocated the Presence control to the power amp section. In addition to that, the new Depth control gives you an incredible boost in the low end. 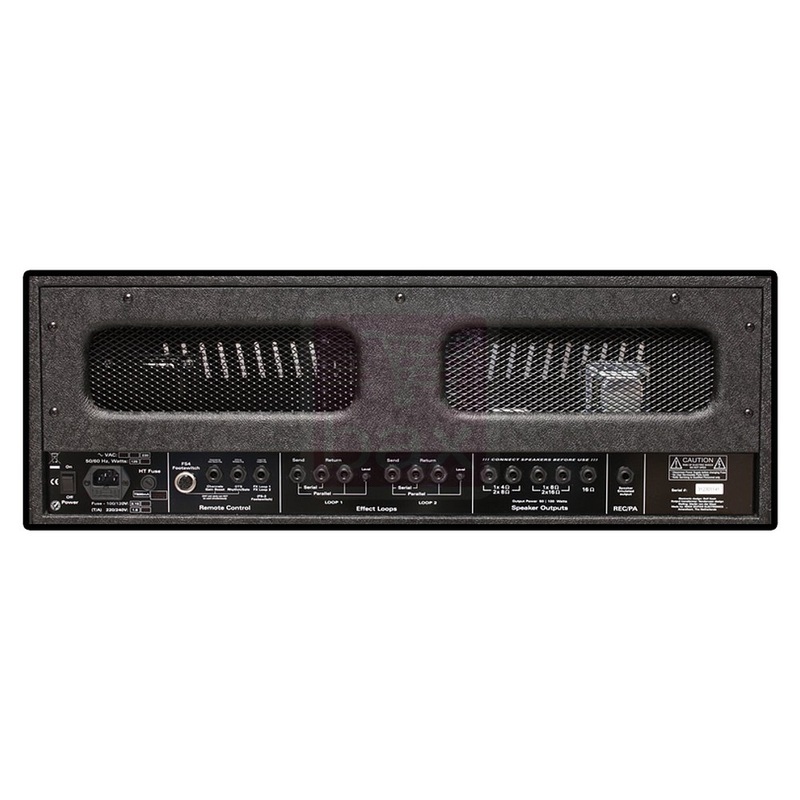 The two effects loops on the back panel offer you the possibility to connect your effects unit in series or parallel. Both loops can be bypassed with an FS2 footswitch or a MIDI switcher. The other functions: Channel 1 & 2, Gain Boost, OTS on/off, Master I and II can all be switched by the included FS4 Footswitch. All these functions can also be accessed by a MIDI switcher via two separate jack inputs to allow maximum flexibility when e.g. integrating the amp in a rack system. For both Live and Recording situations we’ve included a Recording/PA direct output on the back panel of the amp. The Recording/PA output offers you a Speaker-emulated sound coming from a microphone placed in front of your speaker cabinet. 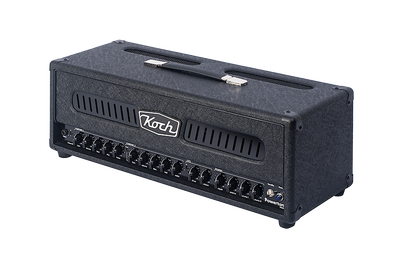 Koch Powertone III head specifications.